To discuss the full range of Current Drivers supplied by Automated Control, please contact us. The MTLx546 accepts a 4/20mA floating signal from a safe-area controller to drive a current/pressure converter (or any other load up to 800Ω) in a hazardous area. For HART valve positioners, the module also permits bi-directional transmission of digital communication signals. Process controllers with a readback facility can detect open or short circuits in the field wiring: if these occur, the current taken into the terminals drops to a preset level. 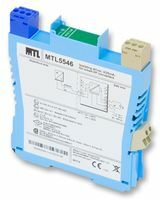 The MTL4546C and the MTLx546Y are very similar to the MTLx546 except that they provide open circuit detection only (i.e. no short-circuit detection). The MTLx549 accepts 4/20mA floating signals from safe-area controllers to drive 2 current/pressure converters (or any other load up to 800Ω) in a hazardous area. For HART valve positioners, the module also permits bi-directional transmission of digital communication signals. Process controllers with a readback facility can detect open or short circuits in the field wiring: if these occur, the current taken into the terminals drops to a preset level. 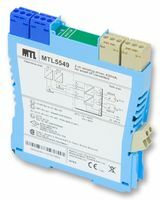 The MTL4549C and MTLx549Y are very similar to the MTLx549 except that they provide open circuit detection only (i.e. no short-circuit detection).